FORT LAUDERDALE/DAVIE, Fla. – Nova Southeastern University’s (NSU) new Holocaust Reflection and Resource Room, made possible by a generous donation by Craig and Barbara Weiner, is set to hold its official grand opening and dedication ceremony on Sunday, October 16 at 10:30 a.m. Judy Paul, the mayor of Davie is expected to be in attendance as well as several Holocaust survivors along with other local dignitaries. The room is on the second floor of NSU’s Alvin Sherman Library located at 3100 Ray Ferrero, Jr. Blvd, Fort Lauderdale-Davie FL 33314. This new facility is the first of its kind on any university campus in South Florida. The room will offer NSU students, and the general public a place to learn about, and to contemplate the horrendous acts that result from intolerance and hate. One of the two rooms will house a number of computers with headphones for NSU students, members of the faculty, staff, and the public at large to research and watch thousands of survivor testimonies, utilize a Holocaust encyclopedia, and research images, films and topics of interest linked to research museums and memorials around the world including the United States Holocaust Memorial Museum in Washington D.C., Yad Vashem in Israel, the Museums at Auschwitz, Buchenwald, Dachau the USC Shoah Foundation and the Imperial War Museum in London. There will also be some 30 or more subject films available for viewing. The room will further highlight hundreds of wall mounted images including research maps depicting the location of the major labor and extermination camps. In addition, an endowed fund has been established to provide resource materials for maintenance of the room as well as to support related special events. “We are extremely grateful for the generosity of Craig and Barbara Weiner. 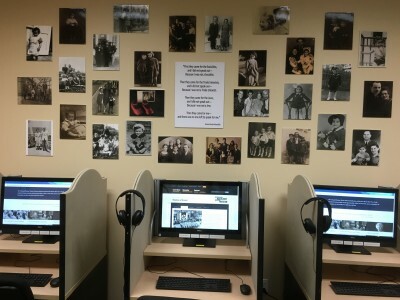 The Holocaust Reflection and Resource Room at the Alvin Sherman Library will house essential educational resources for the NSU community and the residents of Broward County and provide education about this extremely important period in world history,” said Lydia Acosta, M.A., NSU vice president of information services and university librarian. The larger room will house a large flat screen which will play continuous video from the Holocaust period, most of which are actual archival films made with home movie cameras. This room will contain comfortable seating for participants to review a number of historical newspapers from the 1930’s and 1940’s; propaganda material used by the Nazis; book cases filled with Holocaust research books, as well as display cases containing original artifacts. For Craig and Barbara Weiner, their dream of creating a space in South Florida dedicated to these goals led them to the NSU Alvin Sherman Library. Their relationship with NSU began in the 1980s when Barbara earned her B.S. in Elementary Education at NSU, and their children attended NSU University School. Their son later graduated from NSU’s College of Osteopathic Medicine. The Weiners have been generous donors to NSU ever since, and Craig is also a member of NSU’s Ambassadors Board. “We have always felt that the best way for our current and future generations to learn the importance of having greater respect for one another, and greater tolerance for our fellow humankind, is through Holocaust education. This room will provide unique and critical information about the Holocaust that will serve as an educational tool that can impact young people and the general public for years to come,” said Craig Weiner, President of the Holocaust Learning and Education Fund, Inc.
Barbara and Craig co-founded the nonprofit Holocaust Learning and Education Fund, Inc. (HLEF) in 2013 to encourage the expansion of Holocaust education in the United States. Beginning in 2014, HLEF partnered with NSU to host the annual Holocaust Reflection Contest, a statewide initiative enhancing Holocaust education for middle and high school students. The financial gift for the Holocaust Reflection and Resource Room from Craig and Barbara Weiner advances Realizing Potential, NSU’s first comprehensive fundraising campaign. This is the largest philanthropic campaign in its history which aims to raise $250 million for student, faculty, and 21st century education initiatives. To see an interview with Craig and Barbara Weiner and to get a glimpse at some of the artifacts that will be included in the Holocaust Reflection and Resource Room, click HERE.